The perfect home away from home with everything you would ever need and more! If you like TV then this house is for you. There is a large flat screen smart TV in each living area (one with foxtel) and TVs in each bedroom. No need to fight over what to watch! The river and surf beaches, the golf courses (Barwon Heads and Thirteenth Beach) both within five minutes. The historical towns of Queenscliffe, Portarlington, Ocean Grove, Torquay and Anglesea are all within 30 minutes by car. The world famous Bells Beach is only 25 minutes away. The famous winery estates of the Bellarine Peninsula. Geelong and its own historical sites is only 20 minutes away and in winter footy fans have the opportunity to watch a match at the new world class stadium. The Great Ocean Road, Lorne and the beautiful Erskine Falls are less than an hour away. We are a tight family who can have no better time than catching up with other family members and friends in Barwon Heads and around the Bellarine. You will find us at Starfish for breaky, the Pub for a drink and The Beach House for dinner. When we are not eating out we are at the beach, playing golf or hanging around the house in our new pool and entertaining. We always have a full house! 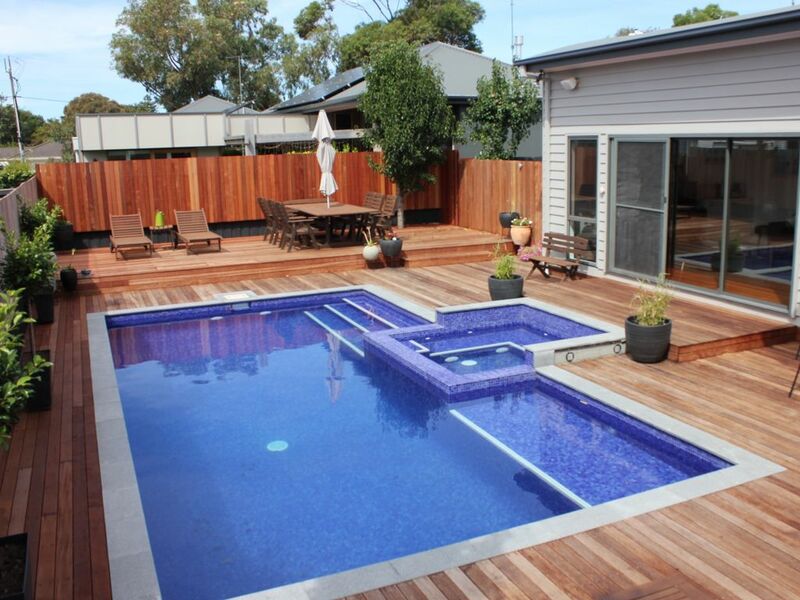 We decided to build in Barwon Heads in 2008 as a result of so many happy childhood memories. I spent all of my Summer holidays on the river or 13th Beach and we wanted our family to experience the amazing life we were lucky enough to have had. The kids are able to ride their bikes and wander up the street without much worry. They have many friends within the town as a result of playing footy for BHFNC over the winter. Barwon Heads means family, fun times, love and laughter to me. The only gripe I have is sitting in the traffic on a Friday night when we drive down from Melbourne, but once we pull in the drive it is all worth it! I'm happy on the beach, my husband is happy on the golf course and the kids are just happy to be out and about. We love Barwon Heads. This house is walking distance to all the best things Barwon Heads has to offer, if you feel like you need to leave the house! We are located 1 kilometre from the surf beaches of Barwon Heads and 500 metres from the gentle river beach. Firewood is available from the service station. Undercover dining area suitable for up to 14. Spent 3 nights at Seabank Barwon Heads, we had 4 couples and the house was more than we could have hoped for. 4 bedrooms with TV's, large lounge & dinning area with Foxtel, fully equipped kitchen with everything you need and large family room. Garden was beautifully maintained and large decked area with Pergola & heating at one end for protection from the elements. Located 10 minutes walking distance from the main street was another huge TICK. Perfect for families or larger groups. Thank you for your lovely words Graeme, I am so pleased you enjoyed your stay with us. Please visit again, regards Nicky. We thoroughly enjoyed our stay at Seabank. There was plenty of space for our 3 families. The games room and piano were great hits with the kids inside, whilst the trampoline and park across the road were perfect outdoor options. We would happily stay there again. This was a great house for a family getaway. Either one family or two. Located in a quiet estate, with a park over the road, and an enclosed backyard with a trampoline. It was a short walk to the shops, lovely big living areas and the garage is set up with games. The rooms were large, and facilities were great. We would stay here again. My friends and i were pleasantly surprised at how beautiful and spacious the house is. It was very clean and we felt welcomed and comfortable the moment we entered the door. Will definitely return the next chance we get. We went down for a weekend with 6 adults and 4 kids and it was fantastic, the kids especially loved the trampoline. The house was immaculate and it felt like a home away from home, there were plenty of toys and the kitchen was fully stocked with utensils, crockery and cutlery. The location was great and we will definitely stay there again. Barwon Heads is alive with ocean air and cool coastal vibes. The town has a dream position with a mix of gentle estuary, rocky coastal headland and ocean beaches. The main street has more than a couple of good places to eat and plenty of boutiques to shop up a storm. A surf at Thirteenth and a coffee at “Starry” - now you're doing it like a local. We are located an easy 500 metre stroll from the main street of Hitchcock Avenue, directly across the road from the park within Seabank Estate. It is only 500 metres to the Barwon Heads Golf Club and to the river beach in the other direction. - Wineries and Restaurants - We are spoilt for choice in Barwon Heads and around the Bellarine. It’s hard to recognise this place as the old fire station, it’s now a cool spot to eat and drink. Breakfast, lunch, dinner, grazing in between, or just for a drink. Bonus of a great deck area to enjoy the sun. Must try: Seafood tastes better by the beach: have the Bouillabaisse – prawns, scallops, white fish, calamari and mussels in a Pernod, chilli and tomato broth with sourdough. Phil’s milk bar of yesteryear has been transformed into a bakery and cafe. Collect your bread or sit and enjoy a coffee, breakfast or lunch under the shade of the trees. Must try: their famous Squishy – fried egg and bacon with their secret mayo in a house made roll. - Standup Paddleboarding on the river - they are available for hire near the playground and the bridge during most holidays and summer. - Surfing - 13th Beach is 4.5 kilometres long and is backed by dunes for most of its length. There are carparks and access staircases scatted along Thirteenth Beach Road, with the best access and safest swimming at the surf life saving club when patrolled (in summer months). There are numerous beach breaks with low to moderate swells and a highlight is the lack of crowds, unlike Ocean Grove beach. Best with northerly winds. - The River Beach - offers shallow water with little or no strong undercurrents, wading pool areas in the sand, eating facilities and toilets, not to mention the play ground. - Go ride A Wave Ocean Grove - Runs 2 hour surf lessons every day at Ocean Grove. Lessons are held in waist deep water and full length wetsuits and soft beginner surf boards are provided. - The Barwon Heads Bluff is where the Barwon River meets the Southern Ocean. It is wonderful to walk around the bluff from either the top or below on the beach with the tide is out. The views looking each direction are quite spectacular. - Adamus Fishing Charters - Rod and Pete have been long time locals of Barwon Heads and they know where the fish are! - If skydiving is your thing, personally I cant understand why anyone would want to jump out of a perfectly good plane, but if you do, Skydive Great Ocean Road is located at the Connewarre Airport. Leap into the sky on your tandem dive and surf the air currents freefalling from 15,000 metres. - If you would prefer to take in the scenery inside the plane, Adventure Flight co is also located at the Connewarre Airport. They offer a variety of aerial adventures including combat aerobatic warbird flights, 12 apostles flights and open cockpit flights just to name a few. - Jirrahlinga Koala & Wildlife Sanctuary - this is a lovely place to take small children or visitors to Australia who want to get up close and personal with Australian native animals. It's not a commercialised zoo, it's a sanctuary for animals who have been injured and are unable to be re-released into the wild. - The Bellarine boasts traditional links and tree-lined courses which are among Australia's very best. Barwon Heads, Ocean Grove and Queenscliff all have sandbelt layouts. Thirteenth Beach Golf Course is currently the home of the Victorian Open. Barwon Heads Golf Club is 500 metres down the road. It's rated one of Australia's top 10 public access golf courses and the magnificent clubhouse is listed by Heritage Victoria and the National Trust. - Bellarine Adventure Golf in Wallington is a fun thing to do with the kids. - Adventure Park Geelong is also located in Wallington, 8 kilometres away. This is Victoria's biggest water theme park with 24 rides rides and attractions. - Amaze N Games in Wallington is a place where you can lose the kids in the maze or challenge them to a game of mini golf. - Lomas Orchards and Berries is a must when visiting the Bellarine over summer. Pick your own strawberries. - The Hive Gallery in Ocean Grove is said to be one of the best regional galleries in Australia. Willie's work has been exhibited at the Chelsea Flower Show in London and the Singapore Garden By the Bay. - Cycling champion Cadel Evans grew up riding around the township of Barwon Heads. There are plenty of tracks to explore the local area.